After Slavko Vorkapich’s designs for the 3-D sequences in The Mask proved to be to expensive, its director, Roffman, found himself without a plan. 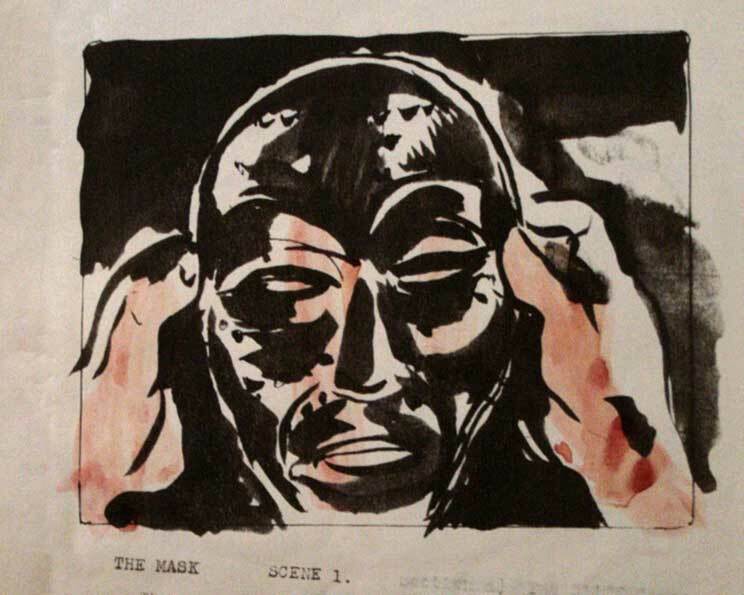 He turned to his friend, avant-guarde filmmaker and artist Len Lye, to create the storyboards. 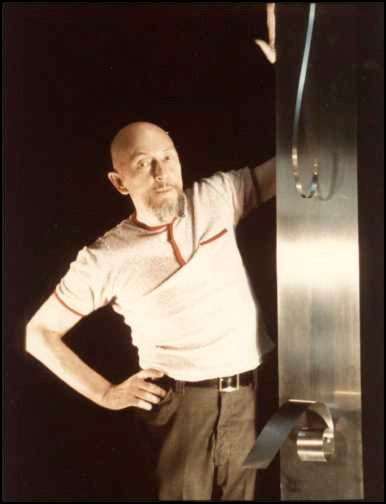 Len Lye was an New Zealand born artist who began his film making career in animation. 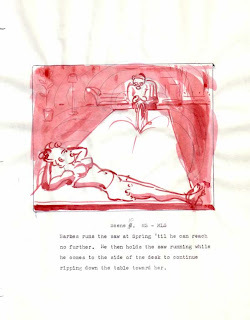 Very much a contemporary of the NFB’s Norman McLaren, Lye began experimenting with camera-less animation before McLaren in 1935, a technique in which the animator drew directly onto the 35mm film strip. 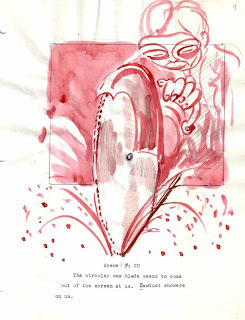 Later in life Lye began creating kinetic sculptures, works of art which featured movement. The Lye storyboards are extravagant works of art, drafted in coloured pencil, in which the 3-D compositions are always present in the artwork. Again Roffman discarded the designs, because the cost was deemed to be too high. 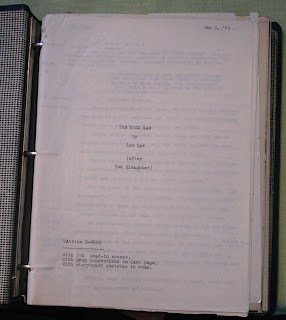 But there may have been another reason as well as indicated by Lye's work on a sequence entitled “The Buzzsaw”. Here Lye indicates that the sequence is designed in the manner of Tod Slaughter, a British horror star of the 30's and 40's. He played no less than Sweeney Todd in The Demon Barber of Fleet Street (1936). Slaughter played his character larger than life, only once removed from the mustache twisting vaudevillian villains. 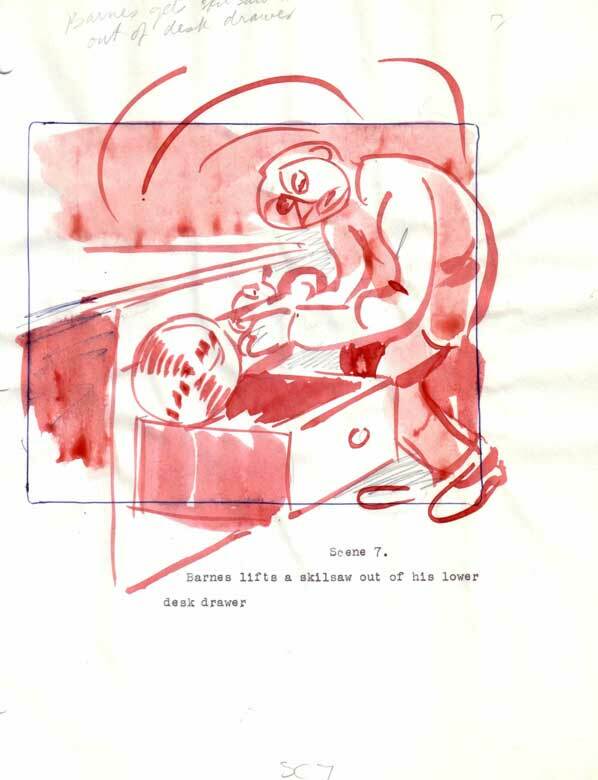 Perhaps Roffman rejected these sequences fearing their camp nature would set the wrong tone for the 3-D sequences, preferring something less theatrical and more psychological. I've never seen Lye's story boards before. Are these in the New Plymouth (NZ) archive? 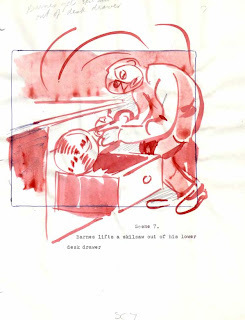 Truthfully, I wasn't aware of Lye's involvement until I saw these storyboards. They reside in Canada in private ownership, the director's son's. thanks for the quick reply... and sorry for my slow one. I am writing a thesis on Lye - in architecture of all things!? It is fascinating to see Lye doing figurative drawings. In the photograph the storyboard looks substantial - was it complete for the feature length film? The date is 1960 - Lye was in the thick of making kinetic sculptures then - he must have been super busy! re. Lye's tendency toward the theatrical - I would agree. In an essay on television in 1939 he proposes a very theatrical solution for poor tv image quality. Lye was all out for maximising 'experience', this often came across as being just too excessive. He may have been similarly worried about 3D film's ability to render form.